If you're looking to buy stuff on PSN, this is the month to do it. 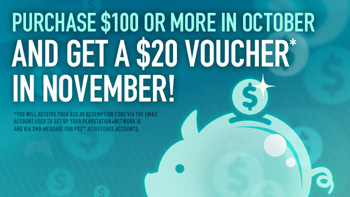 If you spend $100 or more in the PS Store during the month of October, Sony will give you $20 credit to spend in November. And by "spend," I mean "Buy Tokyo Jungle." The promotion is store-wide and includes anything you purchase with your PSN wallet, including non-gaming stuff like PS Plus subscriptions, extended warranties, etc. The credit will be emailed to you in November, or sent via an XMB message if you're using a PS3. The promotion is limited to the first $100 you spend, however. While downloading $100 worth of PSN games might be a little excessive, the promotion does cover the recently announced PSN Day 1 Digital promotion. Picking up Dishonored and Assassin's Creed III, for example, would be enough to net you your $20. If you've already pre-ordered any games from the Day 1 range, that money will count towards your $100 total. The promotion is similar (and arguably superior) to Microsoft's yearly Summer of Arcade bundle deals, which offer you a certain amount of Microsoft Points in exchange for buying a selection of XBLA games. Microsoft has always enjoyed a degree of dominance in the downloadable games market thanks to its aggressive policies regarding exclusivity. Sony has only recently started to fight back by focusing on a number of high profile exclusives and promoting its extensive back catalog.